Preheat your oven to 375. In a bowl, mix all the ingredients (except for the phyllo pastry!) together. 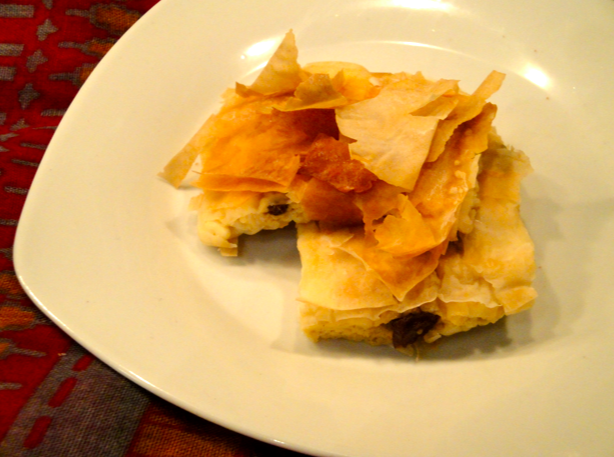 Spread a bit of olive oil on a pan (or put down a sheet of aluminum foil) and put 5-6 sheets of the phyllo pastry. Spread out the cheese mixture onto the phyllo pastry, and then cover it with 5-6 more sheets of phyllo. If you’re a patient person, put a bit of oil in between each phyllo sheet – but it’s okay if you skip this step. It’s good to do if you like pastry-like texture! Bake the phyllo cheese pie for about 20 minutes, or until it’s golden and the corners are a bit well done. Some variations include cutting out the sugar and adding a cup of feta cheese to make a salty appetizer, or adding shredded apples with cinnamon and raisins to the sweet mixture (drain the shredded apple first, as they’re super water-y).